If long winter nights round the kitchen table bargaining hard with Grandma over selling Pall Mall strikes a chord with you, you'll probably be the kind of slots fan who'll warm to renowned online software developer IGT's video slot, Monopoly: Here and Now. 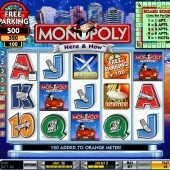 iPad and iPhone users have been used to the new Monopoly version for a while, and slots fans can now enjoy the many delights of the game too. Unlike the traditional game, with its Mayfair and Pentonville Roads, the new version sees you trading for cities like London or Paris; instead of railway stations, airports. It is an exciting evolutionary step for the game that has been welcomed into so many homes and has been played by so many families over the years. So, how have IGT transported the new board game into the slots milieu? Has it managed it successfully, or has it failed to live up to expectations? Well, they certainly haven't skimped on the fun in this 5 reel, 20 payline slot, as there are enough bonus features to placate even the most jaded board game fan. There are regular slots symbols here: 9-through-Ace symbols, each featuring a different playing token, such as the iron-cast bus, mobile phone and airplane. There's also the Monopoly: Here and Now logo, a Utilities symbol, Property and Airports symbols. However, special attention should be made to the Mr. Monopoly symbol, as he acts as the game's Wild. He substitutes for all symbols other than the Board Bonus Dice scatter symbol or the Monopoly Board Bonus symbol. Three Board Bonus Dice symbols scattered anywhere on the reels in consecutive order and on an enabled pay-line triggers the Monopoly Board Bonus Feature game. In this game you'll get to move your piece around a Monopoly board. Landing on a property earns you a payout. That payout can be upgraded if you hit some 'deeds' symbols on the preceding spin (these appear in the corner of some the reels). Remember, the Chance and Community Chest cards from the board game? Land on one of these and you can win free spins or extra rolls of the dice. 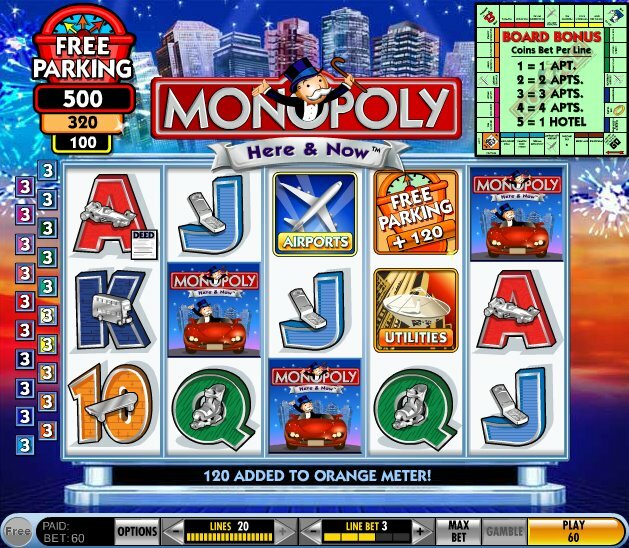 IGT couldn't leave out the Free Parking space, of course, and landing on this triggers a further sub-game which gives you the chance of winning one of the Free Parking Bonus Jackpots. I'm a huge fan of Monopoly, so this slot was perfect in recreating the fun and feel of the board game. IGT have really gone to town in translating the classic for a slots market. Even if you're not a fan of Monopoly, or board games in general, this still delivers in spades. As for me, it's put me in the mood for more board game-related mayhem, so I'll be off to hunt out another one of IGT's Monopoly slots such as Monopoly Dream Life, or IGT's other board game-themed slot, Cluedo.